Veteran international war journalist Ansgar Graw has reported in Georgia, the Gaza Strip, the Soviet Union, Afghanistan, Iraq, Vietnam, China, and Cuba, but has never once been arrested. Now, under the boot of the man who Pulitzer winning journalist James Risen calls “the greatest enemy to press freedom in a generation” – Barack “We Tortured Some Folks” Obama – Graw has been arrested for doing journalism. Graw was in Ferguson reporting on Obama’s violent crackdown on freedom of speech, assembly, and dissent, the purpose of which is, in the words of another journalist who was arrested for reporting in Ferguson, “solely [to] intimidat[e] reporters in order to prevent them from working”. Dozens of journalists and countless residents, including a state senator, have been arrested and/or gassed, and the state is blocking press aircraft from entering the area. …to be handcuffed and snarled at aggressively by the police, and to see a prison from the inside, I had to travel to Ferguson, Missouri in the United States of America. My childlike trust of the US police, who I defended passionately against critics as friends and helpers, in spite of their often rough actions and lack of transparency, is gone. We should all learn from Graw’s example and be honest enough with ourselves to accept that “childlike” is exactly what our propaganda-based notions about the United States are, and “childlike” is what the United States, and all authoritarian governments, would love for the people they control and leech off of to be. The state of Missouri, with the full backing of the Obama administration, has responded to continuing protests against the police murder of Michael Brown, an unarmed African American teenager, by imposing de facto martial law on the largely working class city of Ferguson. Residents have been stripped of the constitutionally guaranteed right to assemble, reporters have been arrested or banished in violation of freedom of the press, police checkpoints have been set up at major intersections. 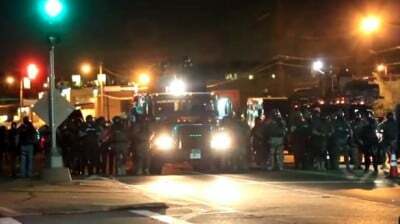 A massive force of military vehicles, helicopters, sound cannon, flash grenades, tear gas, SWAT teams wielding assault weapons and local cops backed by National Guard troops has been deployed to intimidate, terrorize and crush social protest. William Blum here points out one of the ways in which the myth of the USA’s moral superiority is implanted. It’s most ironic. The US government could not say as much about most of their allies [like Israel], who frequently make use of physical abuse. Indeed, the statement could not be made in regard to almost any American police force. But it’s this Cuba that doesn’t beat or torture detainees that is the enemy to be reformed and punished without mercy … 55 years and counting. When countries the USA wants to destabilize, terrorize, and destroy, like Cuba, are caught engaging in non-violent governance, it is not because they are good. They are really bad, they just want to look good. However, when the USA engages in non-violent tactics, that is not because we are merely trying to lookgood, but because we actually are good. See the difference? It’s very scientific. When the USA engages in ultra-violent tactics that surpass anything Cuba has ever done or will ever do – America is by far the most violent and war-like society on Earth – that is also because we are good. When we use non-violence, that’s because we are good, and when we use violence, that’s also because we are good. Graw was never arrested in Gaza or by any other government on which he reported not because those groups are good. They are bad. They just didn’t want to both look bad and be bad. They want to be bad but look good. Bad guys are sneaky that way. We are good. Therefore, everything we do looks good, which is why we arrested Graw. Well… maybe that doesn’t look good, but it doesn’t matter. Remember, since we are good, even if something we do doesn’t look good, it still is good. Mass-arrests, violence, and intimidation against journalists and peaceful protesters (as documented byAmnesty International and others), is good, if we do it. No matter what point the government reaches in this country, just make sure you always take the side of the government. That way, you know you’ll always be on the side of good. You know, good. Like in American movies. If the FBI starts openly assassinating (on Hoover’s orders) people like Fred Hampton again, you know whose side to take: the FBI, because they are good. Internationally, when Obama schemes up new ways to block the Chagossians from ever returning to their homeland, Diego Garcia, because Obama prefers to use it as a base for his killing machines and torture centers, you know which is the good side, and it ain’t the impoverished and dispossessed Chagossians, that’s for damn sure. Sometimes this can seem counter-intuitive, but that’s when it becomes important to put your full on faith in the government that generously allows you a statistically insignificant amount of influence over the policies that dictate your life. A lot of people still think this is some kind of game or signal or spin. They don’t want to believe that Obama wants to crack down on the press and whistleblowers. But he does. Obama has persecuted more whistleblowers than all presidents combined. Robert Barsocchini is an American investigative journalist and writer for the film industry. Click here to join 5,100 people following him and his UK colleague, Dean Robinson, on Twitter.